Got up and started packing and cooking my oatmeal, it was a foggy and overcast morning and the worst part was putting on wet, cold socks and then stuffing my feet into wet nearly frozen boots. I had dry socks but it is pointless wearing them as they would be wet in 5 minutes on the trail…you save your dry socks for inside the shelter! I’m in my rain gear as we are expecting rain and I hit the trail. 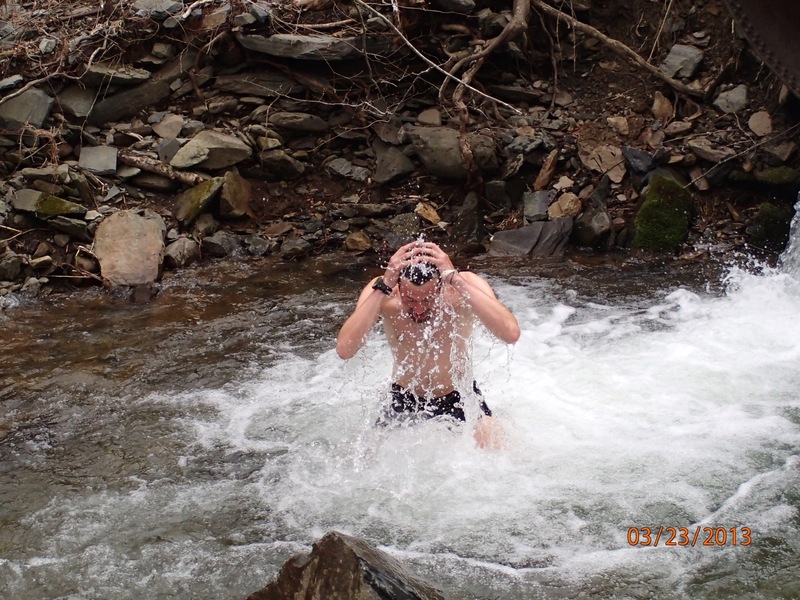 It is icy and there is a lot of snow on the trail…if its not icy it’s muddy and wet. The temperature is about 35 degrees and I start into my 15 mile day, I’m feeling pretty good about 8 miles in and have decided to skip the shelter and push on to the Standing Bear Hostel. After lunch I see some of the other hikers: Tail Lights, Camaro, Witch Doctor, Chris and Cassandra and they have all decided to head to Standing Bear as well…looks like we are doing a 18.4 mile day (my longest). We come to the “mailbox” where we are supposed to drop off the other half of our permit and now we are out of the Smokies, very anti climatic, what I had planned to do in 6 days I did in 5 and even though we saw our coldest day (which was the first day of spring) and the most snow all in all we were blessed with the good weather we had in the smokies. After we pass the the last shelter we hear that Fresh Ground is set up down by the river, a few miles in, this is the same guy that I met a week or so ago doing trail magic. I get renewed strength and hike the 2 miles to his set up…and what a set up!! 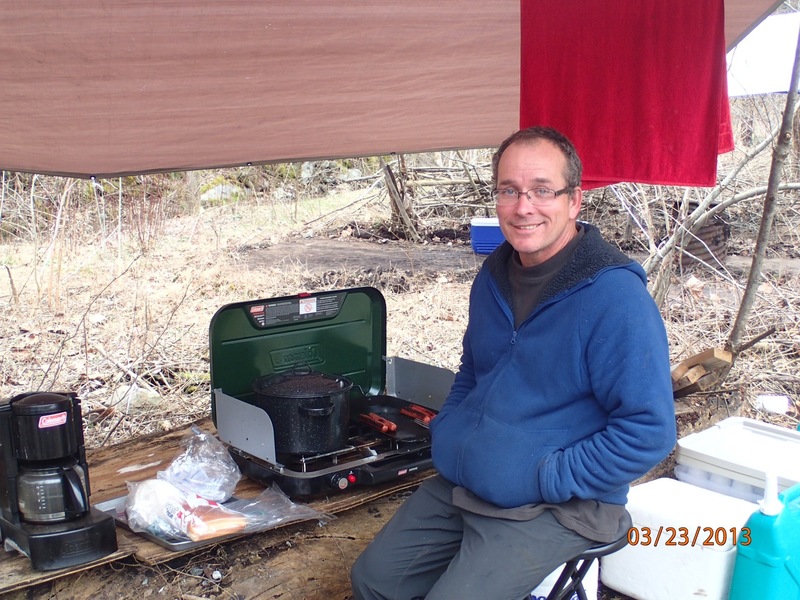 He has several tarps set up and tables as we get there he is grilling hot dogs and has cold sodas in the river! I grab a Mountain Dew and down 2 dogs and a cup of chicken noodle soup. Then I have a 3rd dog and some chips and a little Debbie snack cake. Fresh Ground is a great guy, he offers to run anyone into town or go and grab some pizza or whatever anyone wanted. 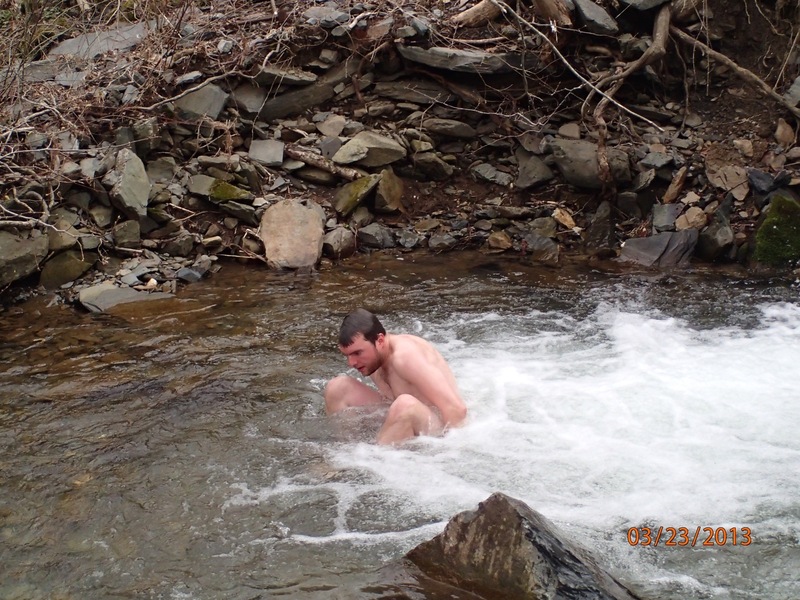 This is an example of true trail magic and he loves doing it, I have been doing trail magic myself along the way. I have bought dinners, paid for rooms, given away food, shared snacks and packed up Gatorade (a nice treat on the mountain but heavy to carry) and then given them away. For me, this is all part of the experience I can hike with God daily and still serve people in little ways. 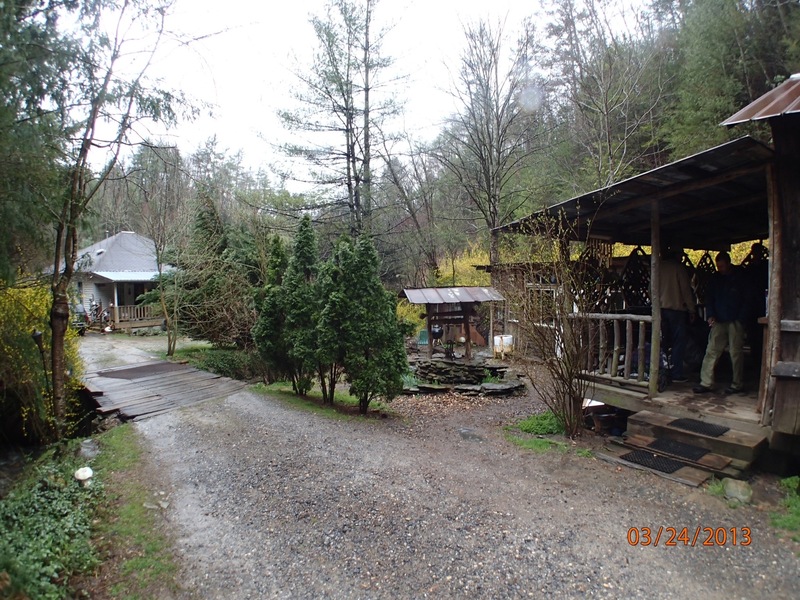 We get to the Hostel and have the option of the bunk house, $15 a person or a cabin for 6 at $20 per person. After one look at the cramp, narrow bunk house I ask the group I’m with to do the cabin and offer to pay the extra $5 per head for anyone who needs it. The cabin has more room and is nice. Everyone does some laundry, mainly socks, and then hit the little store to stock up for tomorrow. I cook up a pizza and share it with Camaro and Tail Lights then get ready to call it a night. Not sure of my plan as of yet for the morning, we are supposed to have another storm coming in and I’m thinking I will leave out of here around lunch and do a quick 7 miles up to the first shelter from there it is 2 days into Hot Springs. It was nice to get a full nights sleep (no one snoring) and I could sleep with my feet 2 feet apart instead of stuck together in a sleeping bag. We got a lot of rain during the night and in the morning it looked like more rain coming. Camaro and Chevy hit the trail first followed by Tail Lights and Ace. I hang with Chris and Cassandra, who we are calling Wide Load since Chris is not allowed to pass her. I say good bye to the owner of Standing Bear and he says, “good luck dad, take care of those kids”…I have decided I need to do something about the gray in my beard! Right now the consensus is to dye it blue or green in Virginia, which might be kinda cool! 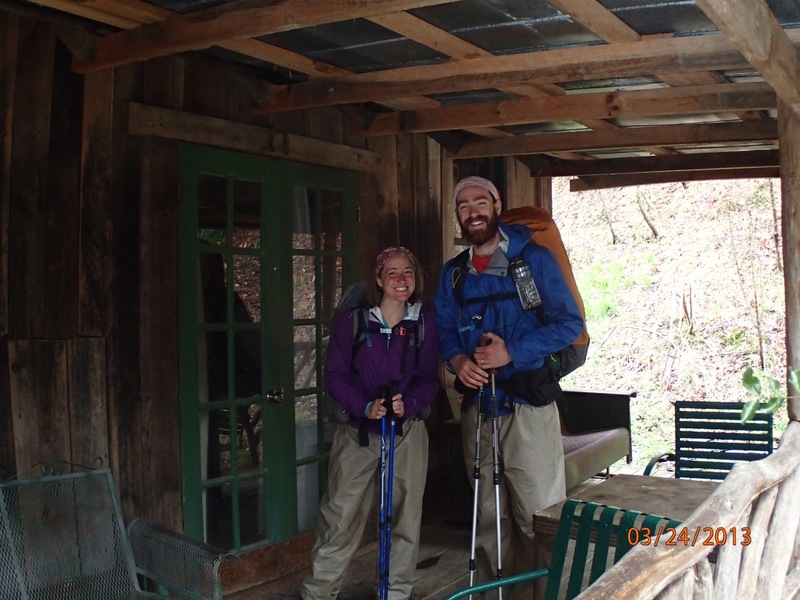 We decide to do a 15.5 to Roaring Fork Shelter even with a late start and hit the trail. 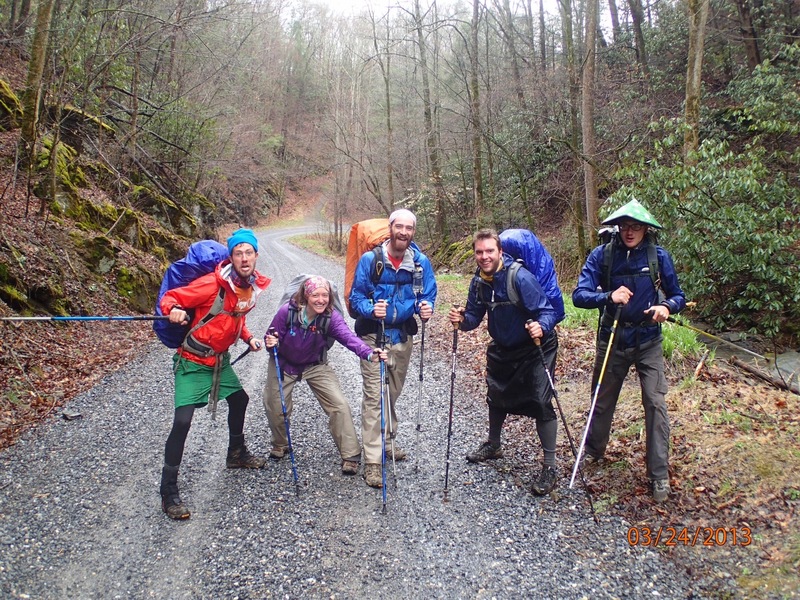 We run into Jack (Golem), Tom (Dry Spot) and Witch Doctor at the trail head and we start our climb. For some reason I am designated as the lead and set the pace for the day. Most of them can hike much faster than me but we all stick together at my not so ground burning pace. 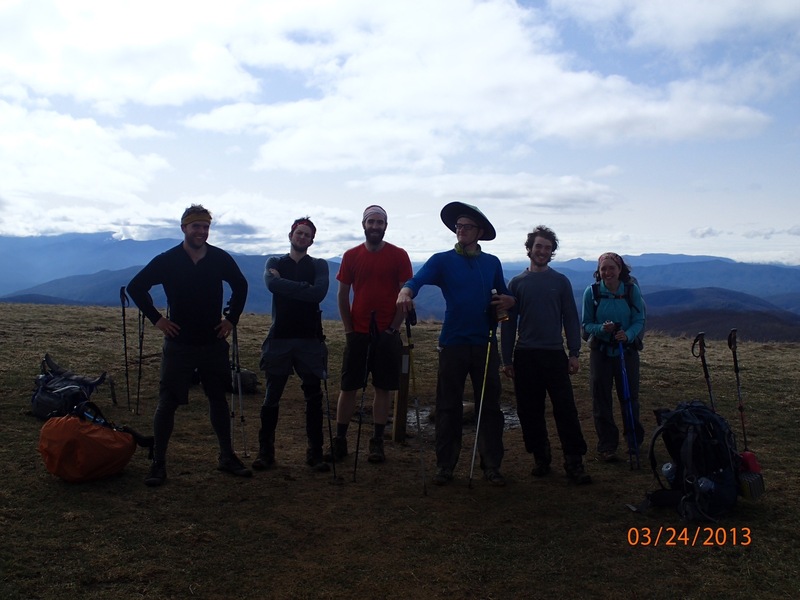 It is fun to hike with a group and it makes the time, and the long painful climbs pass by. A mile or 2 into the hike it starts to rain and the temperature is about 40 after about 8 miles the rain stops and the sky clears. 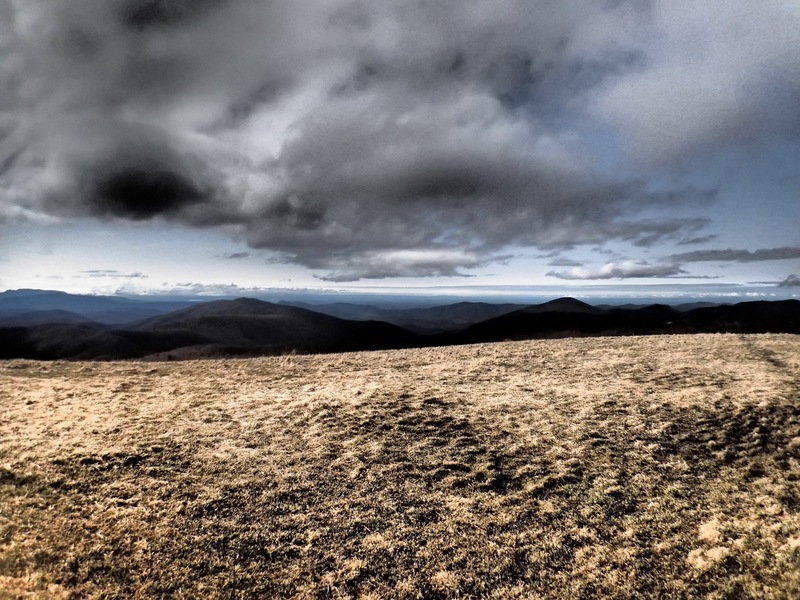 We hit a really cool cleared area called Max Patch, which is a huge grass bald (means top of the mountain with no trees) and celebrate the day with clear blue skies. We finish the day with 2 miles into the shelter. I decide that I want to continue hanging with the group I have been with and take a zero in Hot Springs. We have all eaten and are warm in our bags, we have stuffed 8 peeps into a 6 man shelter, with 4 of our “troop” in their tents. Another storm has rolled in and it is raining outside, I am a little worried about the guys in the tents but they tough it out!. The plan for tomorrow is to do 14.8 miles to the next shelter and then 3 miles into Hot Springs the next day. I’m hoping the rain clears out tomorrow. As usual the plan changed. The rain storm turned into snow and it was windy enough to blow a light coat of snow on to all of us in the shelter. I don’t think any of us really wanted to get out of our sleeping bags yet everyone was up and packing by 7:30. I wolf down 2 strawberry pop tarts and head out into the 22 degree still blowing snow. It is an easy start for the day and we have all decided to hike straight into Hot Springs which will be an 18 mile day. I make pretty good time starting off and I have fresh snow with no tracks, I try to pay attention to the white blazes since I know that anybody following will just be following my footprints. The wind is howling and you can hear branches swaying, creaking and cracking…there are lots of broken branches on and around the trail and you can see whole trees that have toppled over. Despite the snow blowing in my face I constantly look up into the trees every time I hear a creak or cracking sound! After about the mid point, my fellow hikers start to pass me…Cassandra and Chris go flying by with Cassandra in the lead…she is ready to get off the mountain and is motivated to speed (she admits to daydreaming about Mountain Dew)…I don’t even bother trying to keep up with them! I am really startling to feel this hike and my feet are very sore, I still have about 7 miles to go! I manage to drag myself into town and realize that even with the pain I did 18 miles in just over 7 hours. There are 10 of us staying in town tonight and we rent 2 VERY small cabins for the night. Everyone grabs a shower and some down time and then we head into town for dinner. 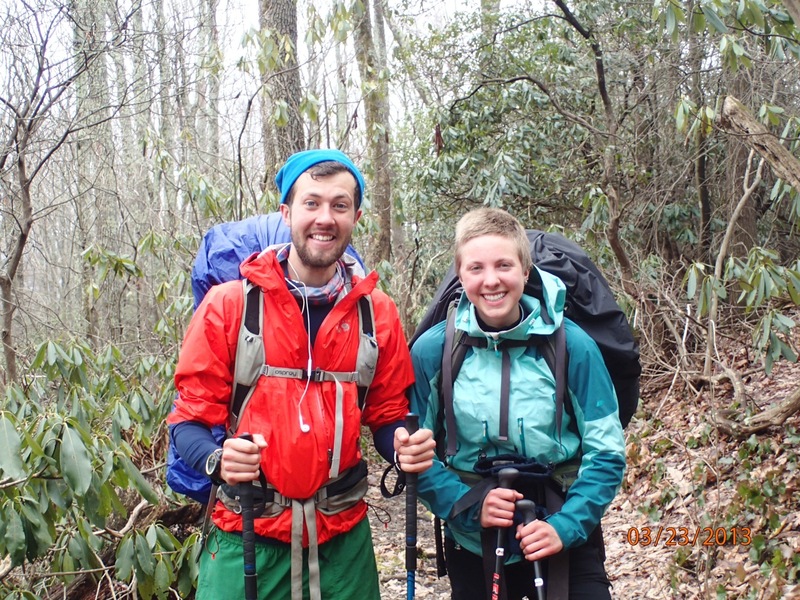 We are recognized pretty quickly as thru hikers since just about all of us are wearing muddy crocs (the most popular camp shoe) as opposed to muddy, wet hiking boots! What is interesting about all of us being together is that other then 2 friends from Colorado and our married couple we have all met on the trail. We have practically spent 24 hours a day for the past 7 days together. We eat together, sleep huddled together, and often hike together. There are stories of why we are here, what we are trying to find or discover about ourselves and a hint of what we might do next. We already talk about meeting next year for a reunion or to do some trail magic together…yet as some are taking a zero day tomorrow others are headed back on to the trail and there is the chance of never seeing them on the trail again! You could spend the next 5 months with someone you know just one day ahead of you. 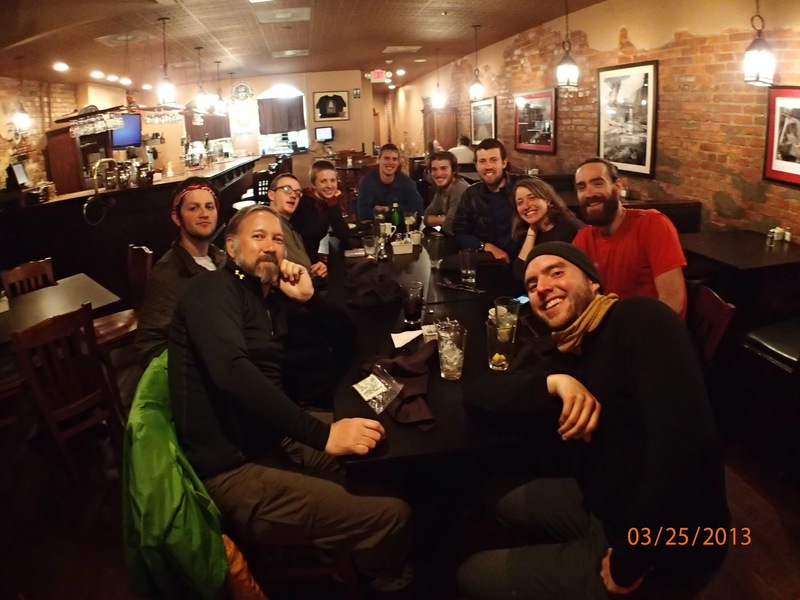 We make friendships out here and like everything on the AT they all keep moving north as we move north together or a part…we are NoBos (north bound) to Maine. It’s been really nice taking a zero in Hot Springs, the cabin (really just a 3 level shed) that we stayed in last night was comfortable but extremely small. We packed up in the morning and got some nice rooms on the Main Street of town. Most of a zero day is spent doing laundry, eating large meals and restocking food supply for the next 5 days on the trail. I’m still with the same basic group of about 10 hikers and we are having a lot of fun together. We have had some great meals and Jack and Tom (the Colorado boys) are a never ending source of entertainment! I joke that I am staying in Hot Springs until the cold weather goes away…”I’m not leaving here until I see daisies!” But I’m sure I will be back on the trail tomorrow with the rest of crew. The weather is supposed to be better but we will still have to deal with the cold and the snow…low temperatures should be in the 30’s but that is actually a lot easier to deal with then the teens! A funny thing that is happening now is that even though I am a “solo” hiker I find myself wanting to adjust to a schedule that keeps me with this group longer. 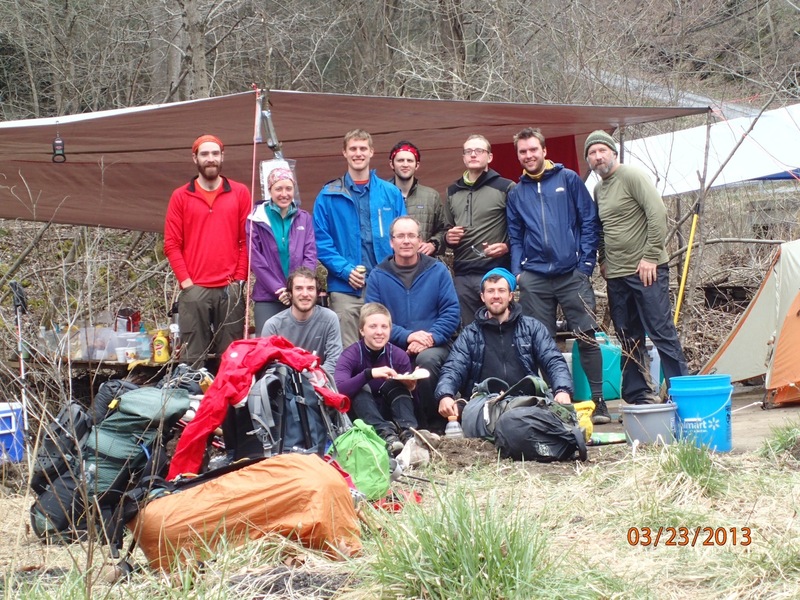 The biggest acronym used out here is HYOH (hike your own hike)…but in my mind if I decide to stick with this group then that is exactly what I am doing. It has been good day and a nice night, I am with people that I have no problem calling friends. Hot Spring is a cool little mountain town and I half wish for more snow so I could stay another day. 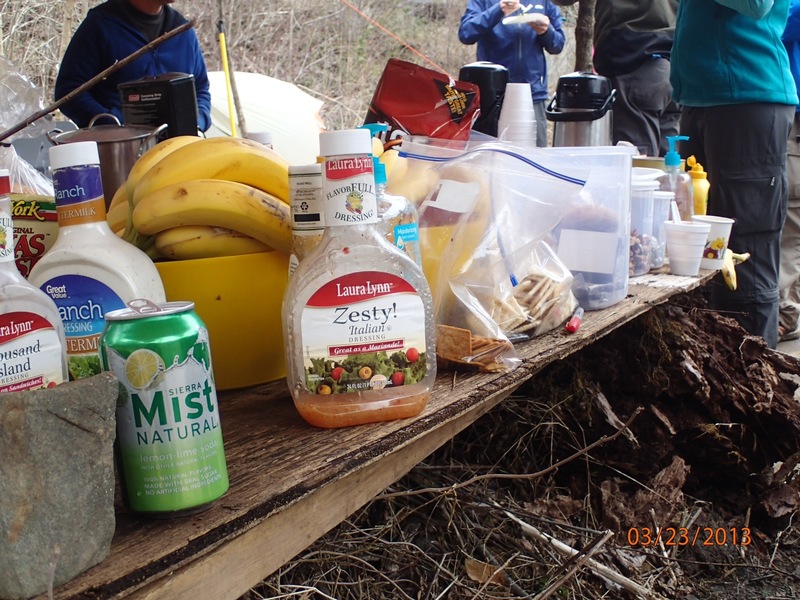 Sadly, the forecast looks pretty good so looks like we will be hitting the trail again tomorrow…after a big breakfast at the local diner of course! Looks like something I would never want to stop doing. What an experience! Thanks so much for letting us do it with you!!!! Thank you so much! It is such a gift to get to read about your days and see your photos. You all look amazingly happy!